Discussion in 'Mechanical' started by Tony, Aug 15, 2016. I bought The Multi with Pirelli Angel St's fitted.. The tyres were not new, so not sure of mileage on them before hand, I have covered 3k and have found them to be good in the dry and fair in the wet..
Bridgestone T30 Evo £203 " "
Metzeler Roadtec 01 £223 " "
And Once again the Pirelli Angel ST at only £136.90 pair Delivered. Any Comments from you guys would be appreciated. Roadsmarts are very new, so not many people have the experience, I love them but too early to guess the mileage. they do have very good write ups though. Metzelers I have found wear very quick and unevenly on some tyres, bikes, but no experience personally of the ones listed. 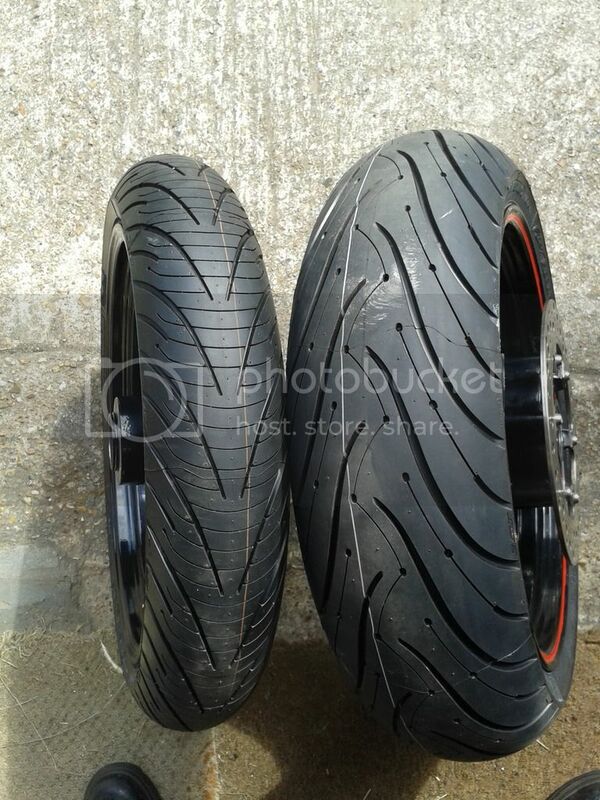 The Metzeler Z8, are great tyres, I found they give really good feedback, and you can feel them loosing grip when pushed rather than let go without warning. With the the old M3's and even to some extent the M5's the front would wear off centre due to the road camber after about 3-4000miles, but they are really Super Sport tyres. The Z8's I have have seen me through 2 years and pushing 5-6000 miles a fair wear and still tread left. The Roadtec 01, are supposed to be even better and I think topped the MCN review. I think Modern Sport Touring Tyres have come a really long way in the last few years. I think all the tyres you have chosen will do the job well. It really boils down to maybe your Brand preference and personal psychological impact. lisa lou and Tony like this. I'm a PR3/4 man, I have just fitted the Roadsmarts 3 and have now done just over 2500 miles on them...... so far ok in the dry so so,I still feel the PR's give a better feel,and In the wet it's the same story, just did a Trackday at Silverstone in the wet and I found the Roadsmarts just twitched all the time when feeding the power in..... the PR's simply don't. As for the milage, i've done 2500 miles and they are wearing very well, but for me it's back to the PR's as soon as the rear is done. I do ride 'Spiritedly' both on and off track with a lot of 2up riding and touring. as said before tyres are a very Personal thing, what works for one doesn't for someone else. lisa lou, Vitesse45 and Tony like this.